Running red lights is a serious safety issue, causing hundreds of traffic-related fatalities and tens of thousands of injuries every year. In 2014 alone, 709 people died and approximately 126,000 people were injured in traffic accidents where red light running was a factor. A study performed by the Insurance Institute for Highway Safety (IIHS) examined accidents in urban areas and discovered that collisions involving motorists who ran red lights, stop signs, and types of traffic controls accounted for the most common type- 22 percent. Furthermore, in collisions where red light running was involved, injuries were reported in 39 percent of them. Prior to the use of red light cameras, a study was conducted at five busy intersections in Fairfax, Virginia. Over the course of several months, it was determined that every 20 minutes, a driver at each of the intersections ran a red light. Drivers did so even more frequently during peak travel times. Red light violation data from 19 intersections without the aid of red light cameras across four states determined a rate of 3.2 violations per intersection every hour. The AAA Foundation for Traffic Safety conducted a telephone poll in 2015 in which 94 percent of motorists said it’s unacceptable to run a red light if stopping safely is possible. However, 39 percent of those same people admitted to having done so within the last 30 days. A 2011 IIHS survey of 14 large cities with established red light camera programs asked drivers the same questions. 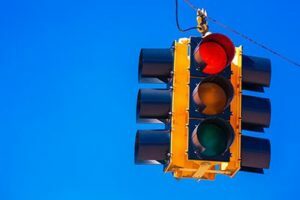 Eighty-two percent of them believed that red light running is a grievous threat to their personal safety, and 93 percent of them said that it is an unacceptable practice. Even so, 7 percent of the drivers polled confessed to having driven through at least one red light in the past month. Fatal red light running data for multiple-vehicle crashes indicates that red light runners tend to be younger males with previous crashes or alcohol-impaired driving convictions. Red light violators were also more apt to be alcohol-impaired or speeding when the crash occurred and were less likely to possess a valid driver’s license. An important way to reduce accidents caused by running red lights is to provide sufficient yellow signal time. Studies indicate that if yellow light times were increased to the values found in guidelines published by the Institute of Transportation Engineers, the frequency of red light violations would be substantially reduced, subsequently reducing the number of injury and right-angle accidents. To further reduce the number of red light violations, red light cameras may need to be used in conjunction with lengthened yellow light times. An IIHS study performed in Philadelphia showed that while longer yellow light times reduced violations by 36 percent, adding red light cameras reduced the violations by another 96 percent. Our Colorado Springs personal injury attorneys will relentlessly pursue an investigation of your car accident. We will communicate with the insurance companies and other parties responsible for compensating you for your injuries, or for the wrongful death of your loved one. Our primary goal is to uncover the truth and use this knowledge to secure the greatest amount of compensation for your claim. Contact the experienced Colorado Springs car accident attorneys at the Green Law Firm today to schedule a no-obligation consultation and discuss your case. Call us today at 1-719-694-8515.